We are back for another edit and this time it’s time to reintroduce retro 70’s Redux style back into our wardrobes. Last week we gave you Garden Party style inspo which you loved but now it’s time to move on to a muhc loved trend which is sure to get you in the spirit of summer and have you wanderlusting through hazy days in 70’s style pieces currently at TJC! Past trends are always coming back into style as a result of the ever moving fashion cycle and if you hadn’t already noticed, 70’s style has made its big comeback this season, however, it’s no surprise that not all of us are ready to step out in full 70’s gear (I dont blame you! ), instead introduce this retro groovy style with minimal style tips and personalise it to fit into your already existing wardrobe. So, lets refresh your summer wardrobe with some 70’s essentials! Make an undeniable style statement this season with a 70’s revamp. TJC’s talented fashion buyer, YI. Fills us in on all things 70’s style currently at TJC, take a look at our mood board and bag what you can through our Pinterest Board… Happy Shopping! 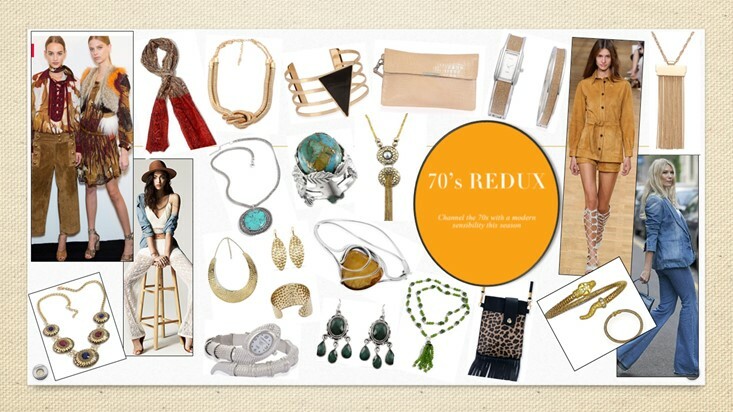 Follow The Jewellery Channel ‘s board 70’s Redux Edit on Pinterest.